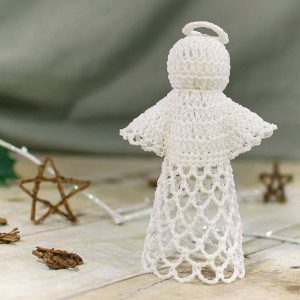 This sweet lace angel crochet pattern is perfect to work up for the holidays or any time you feel that heavenly inspiration. And don’t be intimidated by the delicate design … she’s easier to work up than she looks! Finished angel measures approx. 5 in. high and 3.5 in wide. Notes: Angel is worked from top of head down, halo is worked separately. Round 1: Work 11 dc in furthest ch from hook (skipped chains count as first dc), join – 12 sts. Round 2: Ch 3 (counts as dc here and throughout), work 1 dc in same st as join, work 2 dc in each st around, join – 24 sts. Round 3: Ch 3, work 1 dc in next st and each st around, join – 24 sts. Round 4: Ch 3, work 1 dc in next st and each st around, join – 24 sts. Round 5: Ch 2 (does not count as st), work 1 dc in next st, dc2tog around, join – 12 sts. Add a bit of stuffing or a cotton ball into head. Round 6: Ch 3, work 1 dc in same st as join, work 2 dc in each st around, join – 24 sts. Round 7: Ch 3, work 1 dc in same st as join, 1 dc in next st, *2 dc in next st, 1 dc in next st, repeat from * around, join – 36 sts. Round 8: Ch 3, work 1 dc in same st as join, 1 dc in each of the next 2 sts, *2 dc in next st, 1 dc in each of the next 2 sts, repeat from * around, join – 48 sts. Round 9: Ch 3, work 1 dc in same st as join, 1 dc in each of the next 3 sts, *2 dc in next st, 1 dc in each of the next 3 sts, repeat from * around, join – 60 sts. Round 10: Ch 1, work 1 sc in same st as join and each of the next 5 sts, *ch 3, skip 1 st, 1 sc in next st, rep from * 8 more times, work 1 sc in each of the next 12 sts, **ch 3, skip 1 st, 1 sc in next st, rep from ** 8 more times, work 1 sc in last 6 sts, join – 42 sts, 18 ch-3 loops. Round 11: Ch 1, work 1 sc in same st as join and each of the next 5 sts, skip over all ch-3 loops and work 1 sc in first sc after last ch-3 loop, work 1 sc in each of the next 13 sts, skip over all ch-3 loops and work 1 sc in first sc after last ch-3 loop, work 1 sc in each of the next 12 sts, work 1 sc in each of the last 7 sts, join – 26 sts. Stitch Diagram for Rounds 9 through 11. Beginning in Round 12, do not join rounds; work in a spiral and use a stitch marker to keep track of rounds. Round 12: Ch 1, work 1 sc in same st as join, ch 3, skip next st, *1 sc in next st, ch 3, skip next st, repeat from * around – 13 ch-3 loops. Round 13: Ch 1, *1 sc in next ch-3 loop, ch 4, rep from * around – 13 ch-4 loops. Round 14: *1 sc in next ch-4 loop, ch 4, rep from * around – 13 ch-4 loops. Round 15: Ch 1, *1 sc in next ch-4 loop, ch 5, rep from * around – 13 ch-5 loops. Round 16: *1 sc in next ch-5 loop, ch 5, rep from * around – 13 ch-5 loops. Rounds 17 through 18: Repeat Round 16. Sl st in next ch-5 loop and fasten off. Weave in ends. Ch 18 and Sl st in furthest ch from hook to form a ring. Round 1: Ch 1, work 30 sc in ring, join. Fasten off leaving a long enough tail to stitch halo to head, weave in ends. Stitch halo to angel’s head. 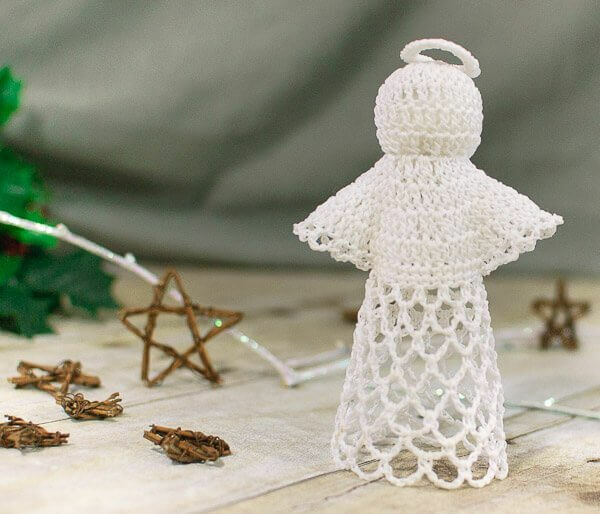 Make a cone out of wax paper (or wrap wax paper around anything cone shaped you might have) and place angel on it, use a pin (I find a T pin works best), to hold the halo above the head, and block with fabric stiffener. 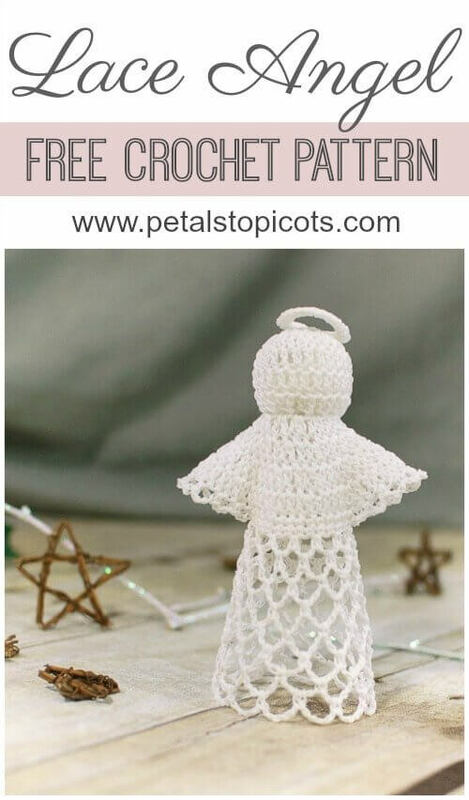 Click here for more free Christmas crochet patterns.